Delineator may be minimal, but it’s absolutely massive…and Richard Serra’s ideas about it are also pretty heavy. Each plate measures in at a mammoth size of 10 x 26 feet and weighs two and a half tons a piece! To put this in perspective, that’s the equivalent of the weight of four Honda Civics! So either this artwork weighs an inordinate amount or I should be more concerned next time I step into my measly little car for a spin. When you enter the gallery, you’ll see that one plate lies on the floor while the other is suspended from the ceiling, creating the shape of a cruciform. Designed not just as a feat of engineering, the work is interactive as well. You don’t need to worry about those overzealous security guards that roam the halls, yelling at people to back away from the art. Not only are you allowed to stand on this piece, you’re encouraged to! Serra believes that by walking through the work, our bodies, the sculpture, and the surrounding environment shift in a way that heightens our perception. Are you buying it? Well, it maybe a long shot that our psychophysical coordinates will move, but either way, interactive art is fun, and it's cool to see how the sculpture changes shape from different perspectives. As you might imagine with a sculpture this big, it wasn’t exactly a walk in the park to get this piece to its final resting place on the fourth floor of the MoMA. To start with, the walls of the gallery had to be rebuilt and the emergency fire sprinklers had to be removed. Next came the issue of how raise this behemoth up four stories. They ultimately uninstalled an elevator and then hoisted the piece up through the empty shaft using a pulley system. Serra explains that by entering his sculpture you are confronted by the physical threat of death and I mean, yeah. If the top plate falls, there's no surviving that one! 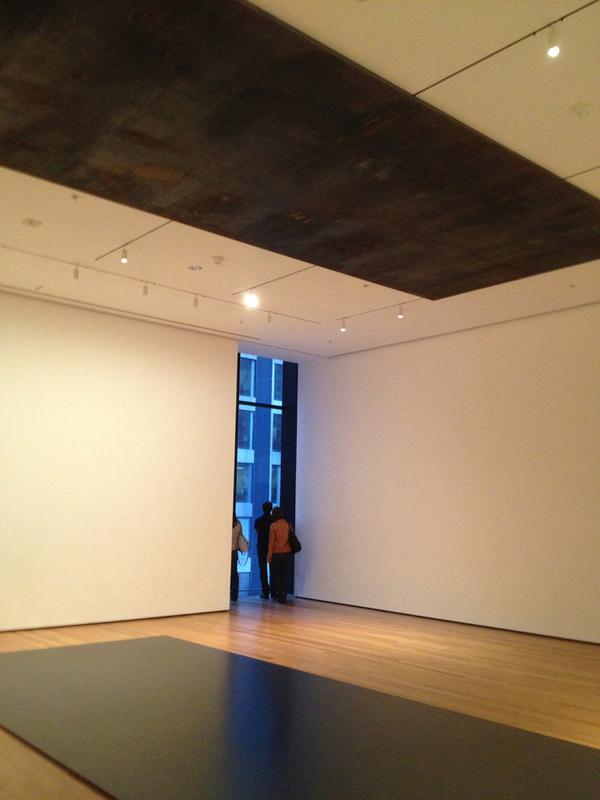 The MoMA has tried to comfort viewers by reporting that the rigging system holding the piece in place can hold three times the weight. We only hope they know what they are talking about.